This overview is 24 of the best ’compact’ enclosure pedals from the collection as such - while I still have just a few more on the essential wishlist to round up before I draw an official end to the major exercise. I have been fascinated by just how many flavours of fuzz there are, and even within each category of a specific sub-genre, how much those pedals can vary. I am doing a series of ’24 of the best’ articles, but I obviously could have chosen many more favourite fuzzes for this roster. It just so happens that we get a lovely spread of different types with some really unique variations in the mix. Right now I have 5 fuzz pedals in my pedal-chain - including the newest arrival - the PLBR Effects Pizzacrusher, but I don’t know for how long that paradigm will hold as I usually have a maximum of 4 slots dedicated to Fuzz. Of those 4 slots there is very little movement on those occupied by the Chase Bliss Audio Brothers Gain Stage and Dr Scientist Frazz Dazzler - both power-house pedals for versatility and very unique in what they bring to the table. My other fuzz slots take a whole lot of rotation to give quality time to each of my other fuzz pedals in the collection - typically with one slot near the start of the chain for sensitive and Germanium style fuzzes, and the Silicon and hardier modern fuzzes appearing much further back - sort of between the overdrives and distortions in the chain. I already have all those listed here bar 2 (including the Beetronics Swarms still to be released), and I did not necessarily expect to land say a Paul Trombetta Bone Machine GTX that soon - but one appeared on Reverb.com in January within the appropriate tolerances and I snapped it up rapido. There are three rather pricey fuzz pedals here including the Abracadabra Audio Ayahuasca, Paul Trombetta Bone Machine GTX and Spaceman Effects Sputnik I - which are all exceptional and unique fuzzes, but will be out of most players reach for a variety or reasons. There is though no shortage of the highest quality of fuzzes for really reasonable prices too - like the Black Arts Toneworks Son of Pharaoh. A few of these pedals are discontinued, but the majority are readily available. Abracadabra Audio is really a sister brand to Chase Bliss Audio - it features Joel Korte as one of the main collaborators - and the pedals are the exact same chassis/platform as the other Chase Bliss pedals - and arrive in the same sort of wooden box and velvet pouch. This pedal is essentially a Gravitas Tremolo plus unique sort of aggressive silicon fuzz-face sounding actually Os Mutantes Regulus VII clone. It sounds really gritty and gnarly - just my type of fuzz - and combines beautifully here with the choppiness of the tremolo - you get wonderful textures here and the sound is richly harmonic and complex. This is one tremendous fuzz really - the only way to get your hands on it currently is to sign up on the Abracadabra site and submit the reasons why you should have one - then wait to be invited to purchase. For a long while these were only available within the USA, but as soon as they extended their reach internationally - I was quick to snap one up. I'm obviously a huge Chase Bliss fan, and this pedal is both an essential Chase Bliss and Fuzz release - highly recommended. Note that there are several different variants, and you don't always get a say in the colourway you receive - I am though delighted with my Green to Magenta acid etched fade/vignette variety! Like many others I first heard this fantastic Roland Bee Baa Clone on That Pedal Show. I was lucky to get my order in quickly as these were sold out in no time - and understandably so as they sound like a sort of super saturated Silicon Fuzz Face, but somehow with lush Germanium overtones - it's just a gloriously rich fuzz tone with plenty of natural feedback. I've also acquired the excellent Anarchy Audio Deadwoods Fuzz - which is a sort of cross between the Boss HM-2 and Shin-Ei FY-2 circuit. Anarchy Audio obviously know their way around a fuzz circuit - and I selected the more accessible of their 2 equally excellent pedals. The signature fuzz for French guitarist Julien Bitoun - the 'Crankled' version is actually a limited edition of 50 - which has 4 knobs instead of the default version's 2, and therefore only 4 rather than the original's 6 internal trim-pots. 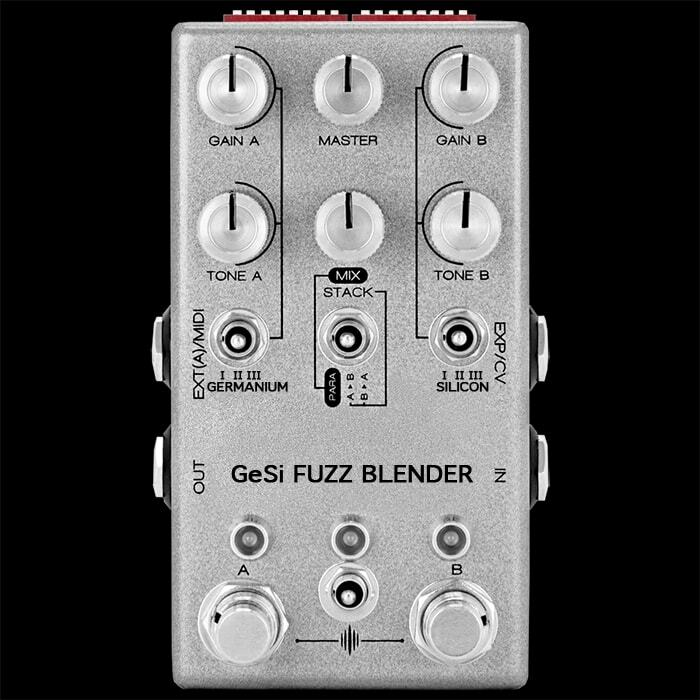 This fuzz essential combines a Fuzz Face style with a Ring Modulation (Octave Up) - for a really searing and gritty custom variety of fuzz. The default Crankled version comes with fully dimed trim-pot controls - while I prefer to trim those back just a hair and then run the Buzz at circa 12 o'clock and the Fuzz at 3 o'clock - for a fantastic searing and thick fuzz. For me the 4-pot version should really be the default version as all the fun comes from the interplay between the Buzz and Fuzz settings and it's way too niggly to be having those as internal trim-pots. I'm trying to encourage Alex to make the Crankled version the official V2 version of the Bitoun fuzz as it's so much more usable. In any case the original and Crankled versions are identical in components apart from the fact that the limited version has 2 more external controls and 2 fewer internal pots - and is set with dimed spitty gated values rather than open and ringing defaults. The Bitoun in any guise is many player's secret weapon and is still somewhat under the radar - an all-round killer fuzz. Right this minute I have two different Octave fuzzes in the chain - this one near the start, and the Beetronics Octahive in the middle. Many view this super-versatile Tone Bender style fuzz as Basic Audio's flagship pedal - with a huge variety of tones onboard via a trio of tone-shaping dials - Tone, Bias and Fat - besides the usual Level and Fuzz controls. If you're a fan of Tone Bender sounds then you should be able to achieve most of those varieties with the 5 dials on offer - it runs the range from throttled and gated to fully open and searing - a really wonderful fuzz and a fantastic benchmark for that sub-genre. I already have 7 Basic Audio fuzzes in the collection - with just two more to go on the round-up - the saxophone-like Zippy and the more full-throated Spooky Tooth - the latter is relatively widely available, while the former is much more rarely seen - for me it's a case of weighting patiently for the right one to appear on Reverb.com. I've had my Beetronics Royal Jelly for a while now, but somehow foolishly managed to overlook the exceptional Octahive fuzz pedal on the first pass. I think partly I just didn't like the look of the standard version or something - as it sounds absolutely glorious - as you can hear in Rabea's above demo. I did a lot of research online and there are scores of different custom variations (enclosures) available on Reverb.com - especially from Swiss dealer RockShop. But I decided the version for me was the Arrowmint edition available on the Beetronics website and sprung for that. There are a number of truly great sounding octave fuzzes out there, and this is most certainly one of that number. Note that the very unique Beetronics enclosures are slightly over-sized compared to the typical compact enclosures. After a fantastic NAMM debut, this so far the smallest of the PLL Schumann clones as far as I'm aware - should be available around Easter time or shortly thereafter. Up until its release I was kind of determined to get the EQD Data Corrupter, but the Swarm fits much more into my style of things - and with the many flavours it showed at NAMM - seems to be very much up my street. I was hoping to encounter one of the prototypes at the recent Birmingham Guitar Show, but none have so far made it across the Atlantic - so we need to wait for the official release to take place - when I will undoubtedly snap one up. For many players this is the essential Big Muff style fuzz in compact enclosure with Lo/Hi mode switch and Germanium or Silicon clipping - and then controls for Tone, High Frequencies, Fuzz and Volume. This pedal has been on my wishlist for such a long time - and every time the wishlist priority rolls around - they are out of stock in the UK. Right now these are fairly few and far between and seem to be out of stock at most suppliers - which attests to just how popular this pedal is. It's a really reasonably priced pedal with just the right degree of tone-shaping. This is one of the few key acquisitions remaining for the reference fuzz collection! Average prices on Reverb.com currently for this much in-demand Univox Superfuzz clone with 3 modes are around £250 - while I acquired one in excellent condition off Ebay for around £120 a little over a year ago - so it's quite the lottery out there. As with any used pedal - you try to acquire as pristine a version as you can for the most reasonable amount of money, and I really lucked out after hunting one of these for several months. There were a few more around back then - but most were way overpriced for the condition they were in - the price has risen steeply since I acquired mine as I would expect to pay much nearer the £200 mark for a version as pristine as mine. This is another octave style fuzz which some find a touch harsh, but tends to cut beautifully through the mix. You see quite a lot of these on a number of celebrated players' boards, and although something of an acquired taste - this pedal does seem to attract legions of devotees. I included this pedal in a recent Best Compact Multi-Drive roundup as it does combine two banks of Boost, Drive and Fuzz for independent or combined channel playback in parallel or series. You have JFET and Integrated Circuit sides for two very different flavours of each variety. In many ways this pedal is conceptually very similar to the slightly larger Strymon Sunset - but with the additional Fuzz voicings. I use this pedal very much as a Fuzz - combining one or both of the Fuzz flavours with the other Boost and Drive variants. With the various options available here there is an enormous range of tones that lives in this pedal - although I did have to dial up the internal gain trim-pot for the B-side of the pedal too match the outputs - highly recommended all-round. You could argue that this is the second Chase Bliss Audio pedal in the listing as the Ayahuasca is to all intents and purposes about 90% Chase Bliss. This amazing pedal was a firm fixture in my pedal-chain for the longest time - being at its essence one of the most versatile Fuzz pedals ever, but also an exceptional multi-mode modulation pedal. I have found fuzz pedals that I like more, and same goes for the big-box modulation workstations, but nothing else comes close to this unique mix within this compact enclosure form factor. There are also some really unique and unusual voices to be found here - and in direct contrast to the new Pizzacrusher q.v. where the Fuzz was added as an afterthought, here I believe the clean mode was the afterthought, and this was always intended to be primarily a fuzz of many voices! Of all the Rat pedals out there, this sort of but not really clone is my favourite by far. One of the few fuzz pedals with full 3-band EQ alongside Dry Mix, Voltage Starve 'Volts' control and second Gain stage activated by separate footswitch. The range of tones here is immense - and no fuzz pedal can give you that high gain static electricity crackle like this one can. It's just an immense fuzz in every sense - you can set it up also to be a less fuzz-sounding distortion too if you wish - it's one pedal which never leaves my chain - I've not really found a fully suitable alternative to it. I'm a big fan of Josh's multi-option pedals - both this and the Tube Screamer equivalent Bonsai. The Muffuletta gives you 6 classic Big Muff flavours in a single compact pedal - which is incredible. I feel Josh should have also added a mids control here to make this pedal even more useful - but there's no doubting the range of quality tones onboard. You get Civil War, Green/Black Russian, 70's Pi, Triangle, Ram's Head and JHS's own High Gain mode - which are all pretty great and entirely useful voicings. I find myself using the Civil War, Triangle and JHS modes the most - and I could really have done with a touch more tone-shaping controls - but as a compact package there is no other equivalent. This is one of the best value fuzzes available anywhere - using a hybrid combination of Silicon and Germanium transistors for maximum impact and versatility. You have 3 tone-shaping controls now with separate Bass and Treble dials alongside the really smart Texture / Voicing control. You can achieve all manner of tones here from fully saturated through to choked and sputtery - both modern and vintage styles. I was somewhat fortunate in holding out on getting this pedal and snapped up the newest V3 version as soon as it materialised. This is another unsung and under the radar fuzz - which should be a contender for anyone thinking of getting a fuzz - I feel this is the perfect first fuzz pedal for someone new to the genre. I am a really big fan of Magnetic Effects in general with 5 pedals overall in the collection. This for me is another one of the classic hybrid fuzz pedals - coming with Germanium and Silicon transistors that you can switch between, and separate switches for Hi/Lo range, 3-way Presence switch and alternative 'Thin' Input Capacitor selector. The pedal has 4 control dials - Volume, Gain, Bore and Mood - where the Bore and Mood controls are key to shaping the tone alongside the Hi/Lo range switch. You can get all manner of tones from this pedal - including horn and octave and even a secret synth mode. You can easily create most types of Fuzz Faze and Tone Bender tones and plenty more besides - this is just one of the most fantastic and versatile fuzz pedals out there - but oh so hard to get. Proper production of these pedals ceased many years ago, and Paul only now makes pedals to his own schedule - one at a time which are then put up for sale on his website - and typically get snapped up immediately. The bad news is that he will only ship to US customers - so the only way us overseas players can get his pedals is via resources like Reverb.com. So I was very lucky to come across a pristine version of the pedal on Reverb.com - and snapped it up immediately even though pricey. I've not seen Paul produce a Bone Machine GTX for quite some time now on his shop page - so these are very few and far between, and unlikely that there are many in circulation in the UK. I would say though if you can afford it you should snap one up on sight - they really are that good. This is the latest addition to my fuzz collection - a bitcrushed fuzz with glitch effects for excellent gnarly texture - if anything, I could do with another dial for more aggression - either to accentuate the gain of the fuzz or the overall bitcrusher and 'Pizza' glitch effects. This pedal sound great as it is, and it was funnily intended as a much more vanilla pedal initially - with the square wave fuzz only added as an afterthought. I feel this is very much a V1 of this pedal - and it will likely split off into two directions - one more vanilla clean glitchy bitcrusher, and the other a more gnarly fuzz-crusher with one or two more controls to up the degree of gnarliness. I've already said that this pedal reminds me of a sort of junior version of a BitQuest with fewer options and far easier to deploy. It's sufficiently distinct to be a sizeable hit for those of us who like these sorts of things! Even though the moniker hints at a Tone Bender style fuzz - sound-wise it is actually much closer to a really creamy vintage style Germanium Fuzz Face. This is one of my favourite Fuzz Face type tones - it's just a gorgeously richly textured fuzz with a smooth liquid afterburn - the pedal can sit anywhere in your chain and sounds fantastic right throughout its range. It's kind of in short supply and I was lucky to come across it on Reverb.com as I don't see too many of these around. I know Scotty Smith is working on expanding his manufacturing capacity and dealer network - so hopefully we will have more of these in circulation some day soon. I keep saying that such and such is the most versatile fuzz pedal ever - but this has to be the one with the most tones onboard overall in this format - although dialling things in and replicating favourite tones is not always as simple as it first appears. There are 4 highly interactive and sensitive controls - Level, Dirt, Gain and Mode - where the last mentioned is a variable sweeping range selector that takes you through all manner of tones including crunch, octave, gated/sputtery, self oscillating and searing high gain varieties of fuzz - these are in particular significantly impacted by Dirt and Gain controls, while at lower levels the 3-way Harmonic toggle-switch is increasingly important as it adjusts the amount of high-frequency harmonics - which ceases to matter much when everything is dimed. I purchased mine direct via Reverb.com and paid c £122 including delivery - which makes it even better value than the White Atom above - while I still recommend that for fuzz beginners - as this one is a little bit more 'pro' and requires more patience and finesse when dialling things in. I have so many pedals in rotation on this one's slot that it really does not get as much time as it warrants. I'm currently playing with the new Wren and Cuff De La Riva - actually right now the Beetronics Arrowmint Octahive, but will probably rotate the Termofuzz back in quickly after that for another fun-filled outing - just a really fun fuzz to play around with. I have a couple of cool pedals from this Athens, Greece maker whom I believe is called Dimitris Pagonas - his excellent Il Mostro multi-drive, and this superb Zvex Woolly Mammoth 7 clone with additional oscillation mode over and above the original. It is not intended to be an exact clone - but matches the controls of the original with a couple of extras - for that really cool gated woolly fuzz sound. It's a slightly different texture to the more celebrate Zvex Fuzz Factory, but is loved by us proper fuzz fans. The enclosure is hand-painted by Dimitris himself and is a fantastic evolution of the original into a more compact dual footswitch chassis. There's no doubt that this core tone is something of an acquired taste - but if you like Woolly Mammoth style tones then it's really handy to have them in such a cool diminutive enclosure. I have six Skreddy pedals in the collection - including the trifecta of Hybrid Fuzz Driver, Lunar Module Mini Deluxe and Screwdriver Mini Deluxe. I feel I have just one more to get - either one of the discontinued 'Mayo' pedals or the newer '1971' model. The Hybrid Fuzz Driver is evolved from the purely Silicon Lunar Module to be more optimised for humbucker style pickups - and adds a Germanium transistor into the mix to give those types of guitars a similar tone profile to what the Lunar Module achieves for single coils. This pedal could not be better described as the tone is very much a fuzzy-drive or hybrid mix itself of fuzz and overdrive - with a really quiet creamy core timbre. I actually like how both the Lunar Module and Hybrid Fuzz Driver sound with my humbucker guitars - which is why I have both - March Ahlfs is obviously a fuzz genius and these are all quality pedals. Like the Boss FZ-2 this is another sort of Univox Superfuzz style octave fuzz - they are not identical by any means, and what is great about the 76 is that it has some really great smoother tones within it to - while the Boss's profile is generally more edgy. That is not to say that the 76 cannot do gnarly - as you can ramp it up to FZ-2 levels when you need to - the overall tonal profiles are just quite different although there is of course some degree of overlap. I have 4 SGFX pedals in the collection and I really rate this Canadian maker - there is no doubt that this is one of the best and most versatile sounding Octave pedals around. I have the custom 'Rust' version as I prefer its look to the standard yellow one - and I believe both models are currently priced the same - which wasn't the case initially - there's also a mint green version floating about if that is more likely to float your boat! Last year I developed just a 'mild' obsession for Spaceman Effects pedals - and their fuzz pedals in particular. For the longest time I was after their Gemini III Dual Fuzz Generator (long discontinued) - which allows you to blend/mix together Germanium and Silicon transistors. To my knowledge this is the only pedal which allows you to finely adjust the Germanium/Silicon transistor mix - as other similar pedals are just straight switching one or the other. In any case at the time these were going for around £1,000 equivalent on Reverb.com and it's just not worth it - with customs and import charges on top of that. I then heard the Sputnik I pedal - essentially based on a super hi-fidelity Fuzz Face type with a couple of extra bells and whistles - those being The Drift/Sync and Filter toggle-switches and Scan dial. The Drif/Sync switch activates a sort of feedback/bias function - controlled by the Scan dial - which gives you all manner of slightly corrupted synth/oscillation/octave/8-bit tones, while the 'Filter' switch is a sort of EQ shift which kind of flips the mids profile from boosted to scooped - and is further enhanced by the super-versatile Calibrate main dial which is essentially a tone control with enormous range. I can flick the two toggle switches on and off with my foot for some fantastic textural variety while playing. I was very fortunate to come across a mint red Cyrillic version in Italy - courtesy of Reverb.com - which made the acquisition possible (no stupid customs fees). The vast majority of these pedals are in the USA, and since both the Sputnik I and Gemini III were discontinued quite a while ago - they can fetch outlandish prices. Looks like the pricing on the Gemini III is stabilising at least / at last - but it only really makes sense to buy from within Europe at the moment - and who knows what will happen after Brexit. I feel that because of its extra dials and switches the Sputnik is slightly more versatile than the Gemini III - although what the Gemini III has is very unique - I'm surprised no one else hasn't done something similar there yet? I'm a huge fan of Adrian Thorpe's pedals - it took me a while to get used to the enclosure design - I really liked it, but still wasn't 100% sure initially - I think I was just put off by the slightly over-sized chassis - which was significantly longer and wider than the typical custom enclosure that I had a preference for. I had heard so many exceptional demos of the Fallout Cloud though (formerly Muffroom Cloud) that I had to get one eventually. Truth is I should have held out a little longer as well within a year of acquiring the pedal, Adrian release his proper compact-size V2 edition of the pedal - and so I had to go through the rigmarole of swapping pedals for my preferred size. In any case this is one of the best Triangle Muff style pedals on the market with plenty of range and those typically superior Thorpy dynamics. I've always said this is a fuzz pedal for players who don't really like fuzz - as you can get some wonderful smooth fuzzy overdrive sounds - slightly different from the Hybrid Fuzz Driver - but in that same sort of ballpark. The Fallout Cloud has significant range to it and I like it pretty full throttled and searing - this pedal has received a lot of accolades and rightly so - it is most probably the crown jewel in Thorpy's range in amongst a number of seriously sparkly jewels. There are other Muffs that are more 'Metal' - more piercing and aggressive - and in most ways this is antithesis of those - yes you can get sort of high gain and textured, but it's always musical and tasteful and not that gnarly. This is another pedal you will now have to hunt down on Reverb.com as it's been finally and terminally concluded as Peter Rutter has now supposedly shifted his remaining component parts. There may be one or two final final versions at a final blow-out sale, but they're near enough gone now for the final time. This is actually my second favourite Rat style circuit - featuring separate Hard clipping diode after the main Soft clipping stage. You have six dials here all in all for Level, Gain, Filter (Tone), Fat (Low End Boost), Hard (Clipping) and Soft (Clipping). It's just a superbly versatile Rat style fuzz with significantly more range onboard. This pedal currently does not get too much of a look-in as it shares a slot with the Frazz Dazzler which offers even more variations in tone and goes quite a bit more gnarly - but both have distinctive core characters and tones which make them both worthwhile choice and really justify owning both. Just as I was waiting for Thorpy initially to bring down the size of his pedal enclosure - so too was I waiting for Zachary Vex to bring out a more usable vertical orientation format of his classic fuzz and drive pedals. The very first to launch was the core Germanium Fuzz Factory, and I've also acquired the Vibrophase since then - with the '59 Sound, Box of Rock and Silicon Fuzz Factory still to go. In any case this essentially Fuzz Face -based circuit is legendary for its 5-dial topology and ability to reach all kinds of weird and wonderful searing and spitty gated sounds. The 5 controls - Volume, Compression, Gate, Drive and Stab are highly sensitive and interactive - and responsible for all the love and hate this pedal receives. You need a lot of patience when handling one of these as you need to adjust dials in tandem - you can't do a demo just concentrating on one dial and then the next as it will frequently sound horrible - you're often adjusting 3 dials simultaneously - and this is therefore not at all a beginner's fuzz pedal. Much like the much-maligned Metal Zone - this pedal's detractors' hate is largely born of ignorance and impatience. If you show this pedal a little love you will get great tones out of it - but overall the experience is very much an acquired taste - which is further hampered by the variability of the Germanium transistors - so if you're short of patience either stay clear or try the Silicon version first! After around circa 18 months of fuzz questing - I believe I'm finally nearing the end of that extensive overview. I now have enough representatives of near enough every flavour and key sub-genre to have a proper understanding within this area and be able to recognise what to look out for in fuzz pedals. Pretty much every pedal I have acquired is great - I don't think a single of my fuzz pedals is even average - and some of these are absolutely amazing - like the 24 above. Considering the enormous range of styles of fuzzes available I am always slightly taken aback by people who say they hate fuzz pedals - as far as I'm concerned they just don't know fuzz! So many of the 60's and 70's rock classics were recorded with fuzz pedals - I just don't think most people are aware of just how prevalent fuzz is in popular music. No matter who you are - there is a fuzz or two out there with your name on it!